After a few sculptural works and paintings in the early 60’s, IAN WILSON discovered that thinking and talking about his objects had as he said ‘ a greater abstraction’ than reproducing the works themselves. He then concentrated exclusively on his long-term project entitled The Discussions. 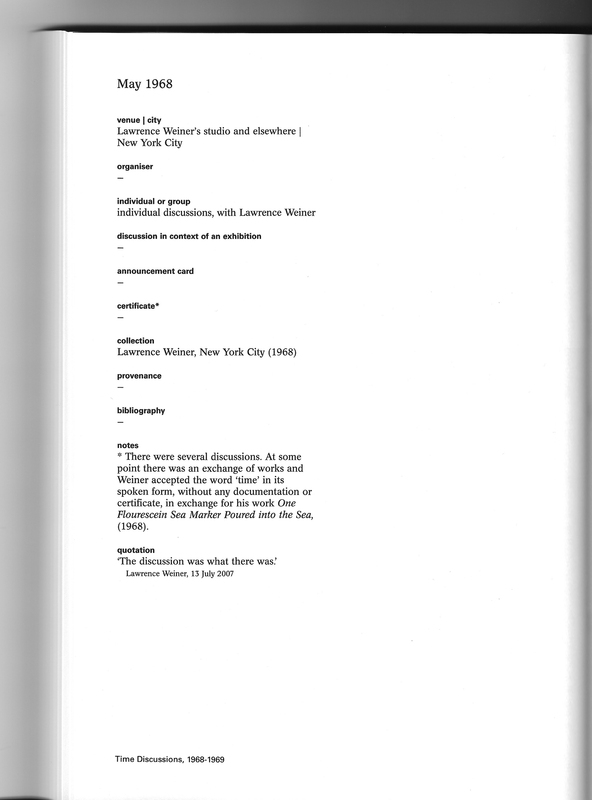 The first Discussion took place in 1968 in LAWRENCE WEINER’s studio. 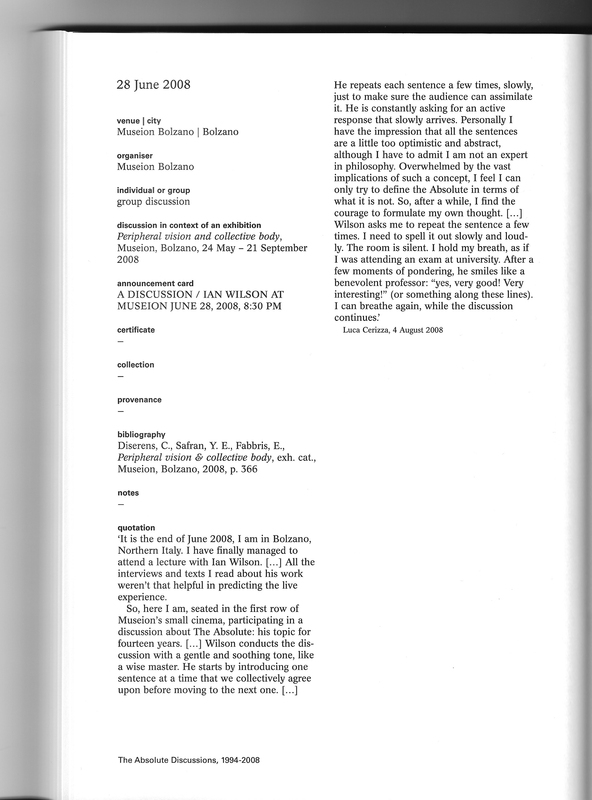 Since then WILSON has conducted Discussions in galleries, museums, and homes internationally. Neither recorded nor transcribed, their only physical manifestation is a certificate signed by the artist marking the time, date and location of their happening and may be subsequently purchased by individuals or institutions. 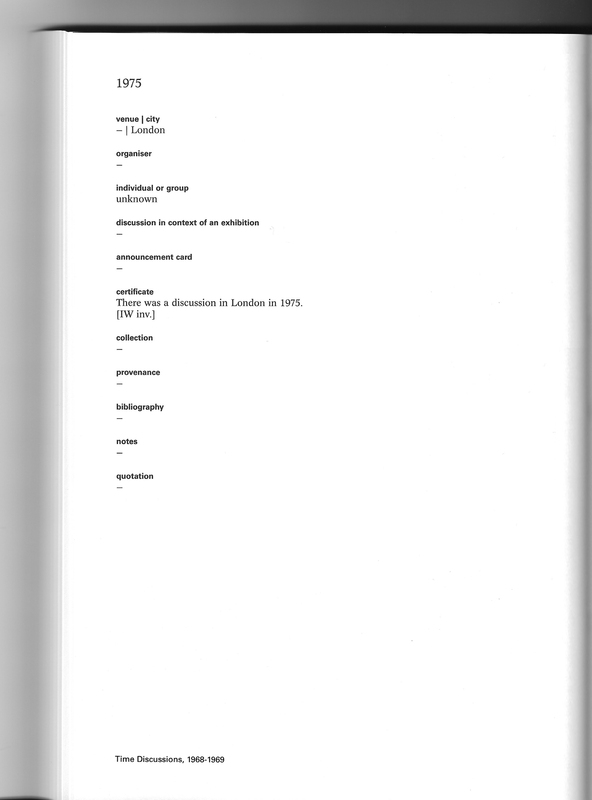 In 2006 the Van Abbemuseum in Eindhoven proposed to document IAN WILSON‘s work into a catalogue raisonné containing all of his discussions from 1968 until 2008. In the book, every discussion is documented separately providing factual informations as well as personal impressions of participants. Please note that the KW Institute for Contemporary Art in Berlin will examine WILSON‘s practice through three corresponding solo presentations by HANNE LIPPARD, ADAM PENDLETON, and PAUL ELLIMAN. According to the press release his work ‘will be physically and conceptually embedded within each exhibition, serving as a framework for exploring roles of language and communication, and the broader significance of interaction between human beings. The exhibition is therefore in constant flux and changes gradually throughout the course of its duration‘. IAN WILSON at KW Institute for Contemporary Art, Berlin is on view from January 20 to May 14, 2017.